For the third day in a row, nearly 250 South Sudanese SPLA-IO soldiers huddled in the shade outside Ethiopia's Gambela airport on Wednesday, waiting to find out whether or not they'd finally be flying to their home capital city of Juba as part of the peace agreement aiming to end South Sudan's two and a half year civil war. Chewing teeth-cleaning miswak twigs with stoic patience, and playing pool with Ethiopian Federal Police officers in the shade of a refreshment tent, this was the closest these troops had come to returning to Juba since the outbreak of ethnic violence between South Sudan People's Liberation Army units in December 2013. Tensions spiraled that year after President Salva Kiir, from the Dinka ethnic group (South Sudan's largest), sacked his deputy Riek Machar, who is from the second largest community, the Nuer, accusing him of plotting a coup. Clashes between Nuer and Dinka elements of the army in the capital Juba led to the massacre of many Nuer, and the flight of tens of thousands of survivors to the safety of Juba's United Nations base, where they remain. To date the civil war has killed at least 50,000 people and displaced an estimated 2.2 million. A prolonged period of shuttle diplomacy led by regional and international envoys eventually led to the signing of a peace agreement in Addis Adaba in August 2015, which established a framework of power-sharing between the two factions, to be followed by elections after a suitable period. In November 2015 Machar, still in exile in his bush headquarters, was appointed Vice President by his rival Kiir, a position intended to be confirmed in a swearing-in ceremony on the day of his arrival in Juba. In the meantime, the capital would be demilitarized, with troops withdrawing to 25 kilometers (15.5 miles) outside the city. On Monday the big day had supposedly finally arrived. Regional envoys and the world's press gathered in Juba to witness the triumphant return of Machar to the heart of government. But by Wednesday, the red carpets had been rolled up and Machar was still firmly ensconced in his military base of Pagak, close to Gambela airport on the South Sudanese side of the border. The euphoria of Monday night's arrival at the airport had gone, replaced by an air of torpor as hundreds of uniformed soldiers, civilian dignitaries and their wives dozed beside their luggage in the fierce heat. At the heart of the dispute threatening to derail the fragile peace accord is the issue of security, namely the right of both factions to garrison the capital with their own picked troops. The international community-led peace framework agreement demands the demilitarization of the capital, with only token forces to be left in place to maintain order and protect the feuding political chiefs from each other's machinations. Both sides accuse each other of breaking the terms of the agreement, in an attempt to maintain a military edge over the other in the event of clashes. On Tuesday night, a statement from the Juba government accused the Machar camp of attempting to smuggle in "anti tanks, laser guided missiles and heavy machine guns" on the flight scheduled to bring back his contingent. Machar's officials scoffed at this claim, insisting they had only the RPGs, PKM machine-guns and rifles allowed by the agreement. Media spokesman Col. William Deng made counter-accusations about the government. "Last week the Salva Kiir government militarized the city even with the heavy weapons they are talking about... they are not even moving out 25km [as instructed by the agreement]," he said. "The agreement doesn't accept that all tanks and D-30s [howitzers] could be kept in Juba, but they are still in Juba. Here we don't have heavy weapons, we have our tanks, we have our D-30s, but they are in our military barracks." Another sticking point is whether, as Machar demands, he is preceded on his return home by his chief of staff and 244 bodyguards who are currently waiting at the airport in Gambela. Evidently, the Kiir faction is disinclined to allow a large rebel military force to establish itself in the capital's airport without the security guarantee of Machar's presence. 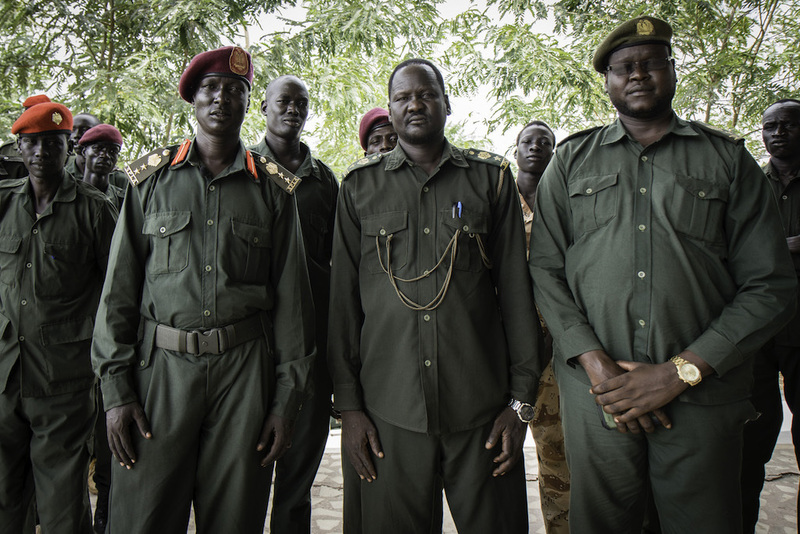 But Machar is equally unwilling to entrust his security to the good intentions of the Juba government rather than to the weapons of his own picked in advance guard. "This idea is not acceptable because we cannot compromise the security of our chairman," Machar's media spokesman said. "Of course we are going to Juba for the implementation of this agreement. There is no reason for the government to claim the arrival of the First Vice President without the accompaniment of his chief of staff and his bodyguards." The body monitoring the peace deal, the Joint Monitoring and Evaluation Commission (JMEC), has called an extraordinary meeting for Thursday to resolve the impasse, warning the agreement is at risk. But with neither side currently willing to budge on what they perceive as essential security guarantees, the prospect of a swift conclusion to this dispute, and to the wider war that has lain the country to waste, seems as distant as ever.